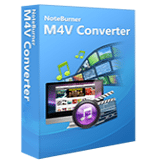 The latest version of NoteBurner M4V Converter Plus brings a complete new level offreedom for your media files.This DRM removal tool actually installs a virtual CD-RW writer on your system that you can then use to remove DRM copy protection. Noteburner 2 works in conjunction with your favorite media playing software to burn DRM-free audio files onto a virtual CD; the only proviso in using this method is that your media player software has to have the facility to burn files to CD. Once the virtual burning process is complete you can then transfer the DRM-free files to any media/MP3 player . NoteBurner has a clean and simple interface that is easy to learn. When first run, you will be greeted with a startup screen that gives you basic tips on how to get started. At the top of the screen there are four icons to click on that quickly get you to all the features of NoteBurner; incidentally, hovering your mouse pointer over each one displays a tooltip that describes what each icon is for. On the main screen there is a convenient feature where you can click on an icon to launch your default media player. Overall the interface is user-friendly, and efficient to use..
Noteburner which helps windows users convert DRM protected M4P, M4A, M4B, AAC musics to plain MP3 with high speed and excellent quality. Unlike other DRM audio converters using sound recording technology, NoteBurner Audio Converter introduces a smart virtual CD-RW burner, which simulates CD burning and CD ripping process, to convert DRM protected M4P, M4B, AA, RA, OMA, WMA to unprotected MP3 and AAC with ID tags preserved. When converting DRM protected audio files using Noteburner you need to keep in mind that your computer must be authorized to play the music before the conversion process can take place. Unlike Tunebite 5 that records the output from the soundcard, NoteBurner emulates the process of burning a CD to make a DRM-free copy. Also The number of formats that NoteBurner can convert varies depending on the media player that you are using to create a burn list. If your player can’t burn it, then NoteBurner can’t help you. But if you find the right player, NoteBurner can handle whatever it will burn. We found that Winamp had the fewest problems with file compatibility, although Windows Media Player and the iTunes Music Player were both compatible with NoteBurner. And also you can use NoteBurner built-in player that has the usual controls but sadly lacks the ‘bells and whistles’ to make it truly user-friendly. For instance, volume control, playlist shuffle, and fast-forward/reverse options are completely missing that puts it at a disadvantage when compared to other competing DRM removal tools like Tunebite 5. This lack of basic features makes the built-in player annoying when you can’t skip through a particular song, or adjust the volume level after conversion.